Logic contradicts the 97% myth. Folks like PopularTechnology.net just show a few thousand papers supporting the anti-AGW view, and it would require an astronomical burden to get back to the 97% of papers (or scientists) agree standard. The same with polls of scientists. For each one scientist (Skeptic), the other side has to find 40 without scientific integrity, and that burden is just too high. So they don't even try. They try to cherry pick their data, exclude dissenters from their samples and know that the media and polemics will still cite them and fail to note the refutations. Cook, Doran & Zimmerman, Anderegg, Lewandowsky, Oreskes are political advocates more than Scientists and they created some really bad "studies" (more cherry picked propaganda) to try to prove their conclusion that 97% agree. That's not science. No one who glanced at their methodology would call it quality research. And their studies were all refuted by real Scientists (those following Scientific methods) like Peiser, Pielke, Mockton, Shulte, Khandekar. Strengers, Verheggen and Vringer, AMS (Meteorologists), APEGA (Geologists and Geophysicists), GMU (Climatologists), Lefsrud & Meyer all did far better (methodologically) direct survey's of published scientists to see if there was consensus and/or they agreed with the IPCC's conclusions. They came back with no real consensus, other that high skepticism or contempt for the IPCC's conclusions, and that the trend is headed towards more skepticism over time (rather than less). But these far broader studies, with better methodology are widely ignored by the media, because they don't fit the agenda. That's not science. This doesn't mean you can't believe in AGW. A consensus against AGW doesn't disprove manmade warming, any more than consensus would prove it. But there's still the core question: if most studies show that there's no consensus, and those that do are frauds, and you haven't seen this in your favorite papers or TV shows, then why has the media been lying to you? Do you think they're all incompetent and have no researchers or fact checkers able to do what this article did, or do they have a political agenda and are willing to lie (mislead) the public for their cause? 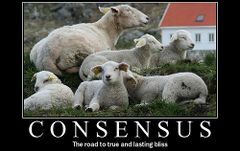 And that leads us to the conclusion, those that claim 97% consensus are either liars or fools. I created variances of this list for a couple decaes (though it's changed over time). While I'd gladly accept corrections, I've yet to have any consensus advocates able to refute it, or any of the studies in it. Their usual tack is to attack me, or go back to citing places that cite these studies, as if their appeal to authority/popularity isn't dependent on the research it's based on. Which tells me what I need to know about them, their sources, and their scientific/intellectual honesty and integrity. 2017 Survey - they found 500 peer reviewed papers that showed deep skepticism on the consensus view (500 in 2016 alone, 1,000 for the prior 3 years). For there to be a 97% consensus, there would have to have been 20,000 peer reviewed papers published in 2016 (there weren't), and all of them would have had to been on Climate Change (they weren't), and the entirety would have had to agree with the consensus view (they don't). 2016 Survey - 67% of 4,092 participating members believe Climate Change is mostly due to man, 33% think Climate Change is natural or they don’t know. 2011 Study - of the 89% of members that think Climate Change is happening: 59% thought humans were primary cause, 11% felt man & nature were equal contributors, 23% felt not enough is known to say. Less that 1% of the member that though it was happening and would be harmful felt it could be prevented through mitigation and adaptation measures. 2009 Survey - 76% disagreed with the IPCC claims that climate change is "mostly man’s fault", 81% felt that the climate models were unreliable, 55% agreed that “global warming is a scam”. These were all filtered polls with lousy methodology. None of them would hold up on their own, but the disingenuous will group them to make it look like there's more evidence than there is. 2009 Doran & Zimmermann They polled 3,146 Government Earth Scientists (none from private sector), then filtered all but 77 that weren't published in a few pro-Global Warming journals, asked them two vague questions and concluded that 75 of the 77 were pro-AGW (Anthropogenic Global Warming). His question standards were far below the IPCC's "most" or ">90%" of Global Warming is caused by man. It was sloppy conclusions so activists were happy to move to the Cook "Study", because this one had little credibility, but it still had more than Anderegg. 2010 Anderegg had worse methodology than Doran & Zimmerman. This one filtered to 908 based on their ability to publish more than 20 papers in pro-AGW publications, and concluded that 97% of those papers didn’t disagree that man was "a major contributor" to current warming. Hardly meeting the IPCC standards or conclusive of anything. Most people didn't cite Anderegg. 2010 Lewandowsky used other datasets (Oreskes, Anderegg and Doran) which had overlapping data (thus over-counted). Since your conclusions are only as good as your sources, and all the sources were discredited, we say GIGO (Garbage-in, Garbage-out), and virtually no one cites Lewandowsky, other than some like Cook who throw it in to their study of studies to bias the results. History Professor Naomi Oreskes wrote a global warming activism essay that claimed her search on “global warming” found 928 papers, and 75% agreed with her view (and 25% held no opinion), starting the fable that there was 100% consensus on Global Warming. Peiser & Pielke challenged Oreskes on the stupidity of her claims, and showed that (a) only 13 of the 928 papers actually agreed with the IPCC (b) her search terms were misrepresented (which she later corrected) (c) twice as many papers explicitly rejected AGW than supported it (d) Science disgraced themselves by publishing Oreskes but being unwilling to publish the better researched refutation. Mockton, Shulte and Khandekar, each separately refuted Oreskes and showed the claims, while oft cited, were not valid.